a) Traditional candle and spoon. d) Painless wax seal sticker. If you are using candle and spoon, it is suggested to cut the sealing wax into small pieces, around 0.8~1cm. It is easier to control the wax amount for each seal. If you are using “Sealing Wax Beads” in our store, 2 beads are enough for a seal. Drip the wax and stamp on it slowly to avoid air bubbles. Apply a little more force on the seal stamp right before removing it from the imprint. This help to make the imprint more clearly. <REMARKS> DO NOT do this at the beginning, otherwise, the seal will getting thinner and not looking good. DO NOT rush for next stamping. Let the seal stamp to cool down a little bit. When the stamp getting hotter and hotter. The seal takes more time to form the shape. You can use a cool water or wet towel to cool down the stamp after each stamping. With this additional step, indeed saving you quite a lot of time for cooling down. Using glue gun is recommended for mass production. It is the second easy way for mass production. Our “Sealing Wax for Glue Gun” is designed to fit for any standard size glue gun (12mm). You don’t have to worry about melting the sealing wax. Glue gun does do a good job in this part. But it takes you some time to learn how to control the amount of wax. Practice for 10 – 15 seals, you will find it is very easy. We prefer to use the electric hot plate for the mass production. 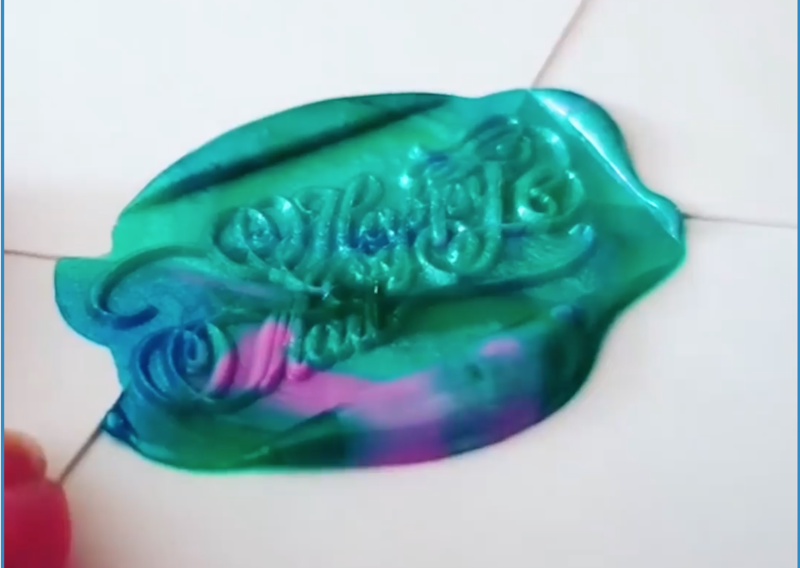 It is the easiest and convenient to make a perfect wax seal on letters and envelops. Comparing to the mentioned method in above, an electric hot plate is easier to control the amount of wax. For example, if I am going to make a 30mm stamp, I will use 4/5 spoon’s wax; if it is 25mm stamp, I will use 3/5 spoon’s wax. The amount of wax can is more precise. Each seal will look like identical others. A PAINLESS way is to order a “Ready-made Self-adhesive Wax Seal Sticker”. We provide one-stop service from design to production and making wax seal sticker. Each sticker has a double sided 3M tape at the back. The only work is PEEL and STICK! There is nothing can be easier than this option! Mixing the color together, perfectly match with a fancy thematic color. Next Can I pay by a credit card instead of PayPal?